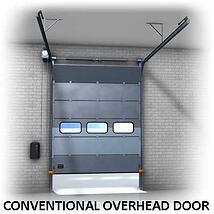 Overhead doors are made of several jointed panels that roll up on tracks above the access or across the ceiling. These doors come with different rail systems depending on the building and the space available. The tracks can either go straight up above the doorway, with a bend towards the ceiling or they can follow the roof pitch. The over head door is primairly used as a service door but also very popular as garage door. The overhead door currently is the best selling door on the market. It is known by different names such as sectional door, section door or garage door. There are many manufacturers that produce this type of service door. In the late 70s and early 80s the overhead doors were introduced as an alternative to non-insulated rolling shutters. 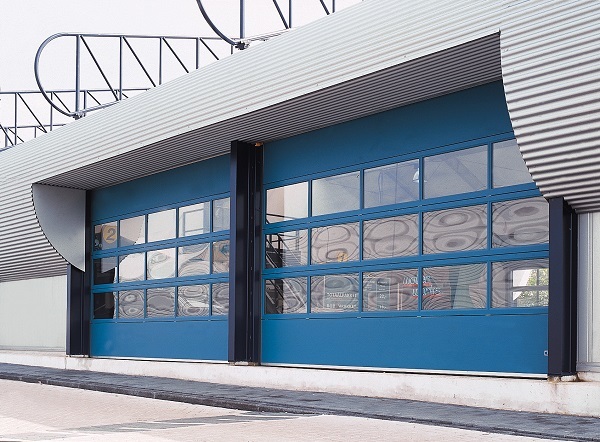 Because they consist of insulated sandwich panels, overhead doors have excellent insulating qualities. Another advantage was the ability to fill the doorframe with transparent glass panels and the installation of a wicket door. 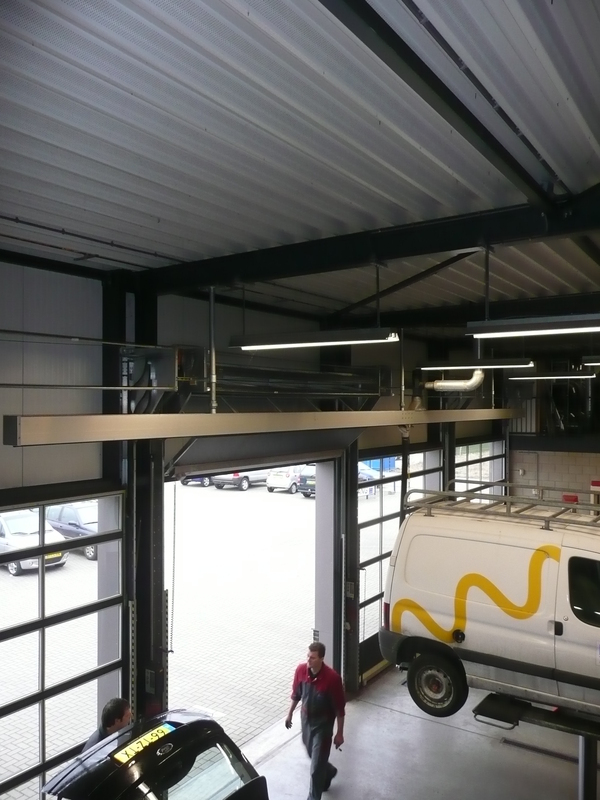 Furthermore, overhead doors are very stable and suitable for relatively large door sizes. One of the biggest disadvantages of over head doors is the rail system. The constructional facilities that are often required to enable the installation of a rail system are quite expensive. In most cases the tracks have to be welded or bolted to the ceiling or the roof structure. The continuous movement of the door can cause serious damage to this structure over time. Another disadvantage is the use of counterbalance springs. These heavy duty springs are put under a lot of tension to compensate the considerable weight of the door so it can move in its tracks. Counterbalance springs have a very high maintenance level. They have to be tightenend and eventually replaced on a regular basis to prevent the door from sagging. 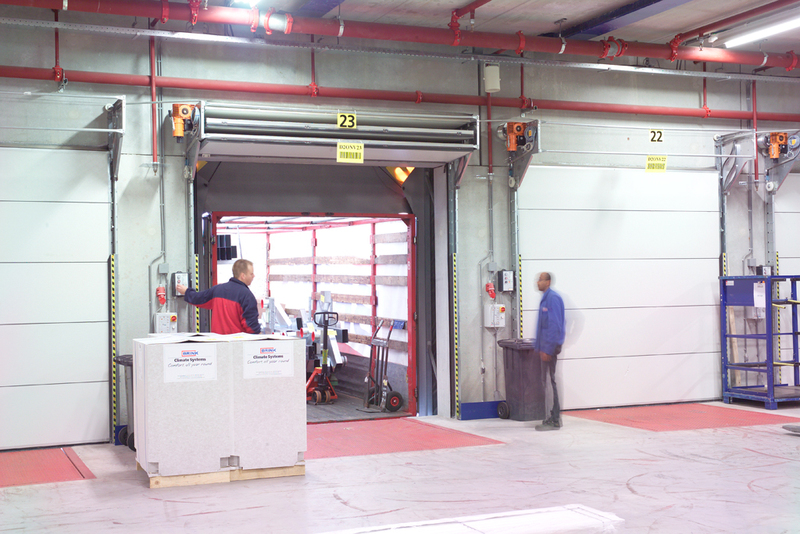 The Compact door can be regarded as an overhead door, because the doorpanels are stored ‘overhead’ when the door is open. From the outside it even looks like any other overhead door, but all the difference is on the inside. The main advantage is that the Compact door is a folding door. This means that it saves a considerable amount of space. Due to the universal rail system, a Compact door always fits and does not require complex structures. Architects have a lot more freedom in design this way and the saved space can be used more effectively. The Compact door does not have maintenance prone counterbalance springs. Moreover, the electric motor is installed on the self supporting system of the door so it does not require structural supports. There are many advantages in the use of a Compact door, as opposed to conventional sectional doors. For example, in buildings where crane tracks are used; Compact doors do not block the daylight coming through skylights or windows above the doorway; the extra space above the doorway can be used as storage space; or for the extra height that is needed for a car lifting platform right behind the door; a sprinkler system, a heater over the door or piping and tubes. These are just a few advantages of the Compact Sectional Door. 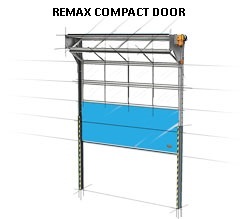 If you are interested in finding out more about Compact Doors or any other Remax products please click here. Or if you would like to speak to our Sales Team, please call on 1800 010 221. The Compact Door is smarter, more efficient and the possibilities are endless.